Attaining Perfect Posture is difficult to achieve. For a select few of you, you can reach your goal of perfect posture. Most of you can get in that perfect posture for short periods of time but revert back to old habits. Still for the unlucky few you can’t even get into that position. The good news for everyone is that, if you do these exercises you will be able to improve your posture. Wall Test: Stand with your back to the wall with your feet a few inches or 5-8 cm away from the back of your foot. Look straight ahead, don’t look up or down. Your head, shoulder blades and buttocks should touch the wall. Hyperlordosis: You feel a large hollow in your lower back. If you put your palm against the wall behind your lower back, your back muscles should be just touching your hand. People with hyperlordosis will feel a much larger gap between the wall and their hand. I find a lot of people try to bring their head backwards by tilting their head back. If you cannot touch your head against the wall or are unwittingly cheating by tilting your head back then do the following exercises. Move the head slowly backwards until it is pulled back as far as it will go and keep it in this position for 4 seconds. Pretend your head is on rails like a train on a rail road. You don’t tilt your head up or down you just slide backwards. You should see a double chin in the mirror. Do this 4 sets of 10 everyday while especially if you sit all day. 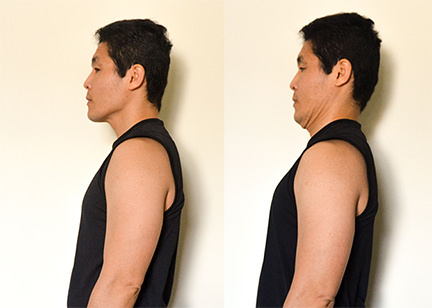 The chin tuck is great for strengthening the front neck muscles but also stretching the neck muscles at the back. On top of this any disc herniations and bulges of the neck vertebrae called cervical spine can be helped by this exercises. By putting pressure on mid back and putting pressure the other way not only do you loosen up the muscles you also take pressure off the disc from the forward pressure from sitting long periods of time. When the pressures are decreased your upper back can get into a more “normal” position so your head can move backwards. You are now on your way to perfect posture. #1 Child Pose: Stretch for your lower back muscles. 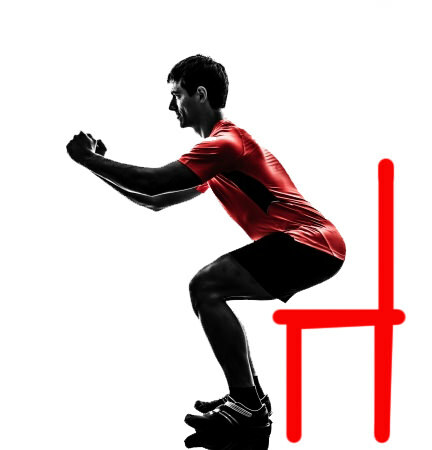 Make sure to not arch your lower back when lowering yourself down to the chair. #4 Front Planks strengthen your abs without putting dangerous pressure on your discs like crunches and sit-ups do. Hold for up to 1 minute at a time. – do the exercise 3 times. Thanks for your question Alberto. I don’t think you can obtain perfect posture either way. You can improve you are posture if you are diligent and consistent. Hope that helps your posture. This is an opinion not a recommendation. I have been diagnosed with si joint dysfunction and have had chiropractic care (2 weeks), been seen by ortho doctor who said he could only prescribe steroids and mucles relaxers, via Spine Center i have had 2 cortisone shots and a nerve carterization. I’ve had 2 xrays and an MRI. Both showed nothing. After the nerve block didn’t work I went back to the spine center and told him it didn’t work, I honestly think he didn’t believe he thought id been lying the whole time, he said it should have worked and the fact that it didn’t meant I was lying. He said he could do nothing more for me. Also, the 1st injection he gave me was in my spine. I found that odd but didn’t say anything. I was frustrated, hurt, disappointed and very sad and depressed. I just cannot live like this for the rest of my life. The pain is debilating and I cannot exercise or participate in many family activities as I could before. I’ve decide to try physical therapy if insurance will pay the majority. I had to quit chiropractic care because I could not afford it, insurance did not pay much and I am on disability (for other reasons), so I had to stop prematurely. When I began reading your post I was excited because everything you said was in line with how I’m feeling, my symtoms and my current procedures and the fact that they haven’t worked. Thanks for your question Wendy. Sounds like you have had a hard time. Often times pain over the Si area isn’t an Si problem. Often times the disc is herniated at L5S1 or higher up. X-rays don’t really show disc herniations although they can tell you the height of the disc, while MRI only show the disc the way you were while lying down. MRIs don’t show how the disc is while sitting, standing or bending forward because most MRI are taken while lying (unless you went to a advanced MRI). There is substantially more pressure on the disc when you bend, lift or simply sit down. Also cortisone shots won’t work if they missed the spot in question, or if the diagnosis is wrong and they hit the “wrong” spot”. It also won’t work if there is no inflammation as cortisone is an anti-inflammatory. Sounds to me as if you need the correct diagnosis. Diagnosis should be made by a careful and thorough history and examination not by multiple MRI and x-ray. They are only used to confirm what the diagnosis is or if you need surgery. Hope that helps your pain and your possible Si Joint dysfunction.